TPC Overall Rank: #121 out of 2933 rides. In User Top 10: 80 times. User Tracker Count: 279 times. Yeah, it's another Batman clone... but there is nothing wrong with Batman clones. They are consistently fun rides, and they pack a punch! It's another Batman! But let's not forget how enjoyable and &amp;quot;oh s**t&amp;quot; the Batman inverts are. The last corkscrew and turn around have you slammed into your seat every time! While there are definitely better inverts out there, these are leaps and bounds better then the SLCs (Mind Eraser has never been a more fitting name) This Batman in particular is suffering from a much needed queue line refurbishment, it feels like you're in a basement or something and I couldn't tell if the trash was part of the theme or just trash that the park never cleaned up. I'm guessing both knowing this place! Always one of my favorites of the day from a trip to SFMM. Seriously, I don't know how any coaster buff couldn't enjoy this one. SFMM has really amped up the 'DC Universe' section of the park in the last few years, not just with the addition of 'Green Lantern: First Flight' or the Wonder Woman whip ride, but just in general the theming is better in this section. 'Batman: The Ride' has always been one of the better theme jobs from SF. You walk through a rather nice Gotham City park only to turn into more desolate and dirty areas, showing the decay of Gotham as you ultimately head into a large sewer tunnel leading you into the Batcave, suit and all. Last time there I had to explain to some girls who were wondering why SF 'liked all the graffiti and grime' the ride's theming offered shortly before you head into the tunnels. 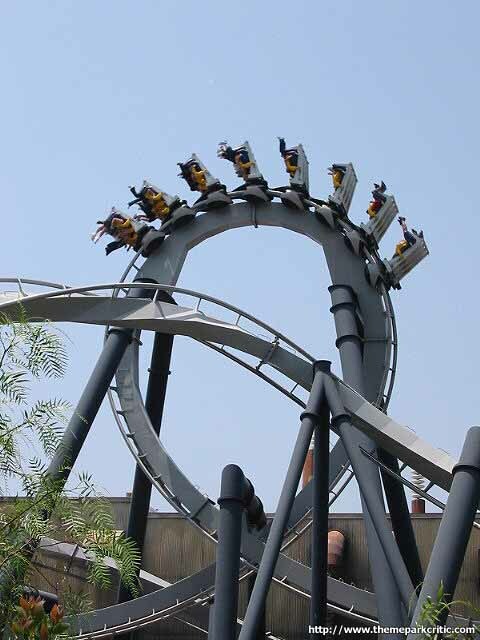 The ride itself is still one of the best inversions out there, short but sweet. I went a few years before riding it again once and it sort of caught me by surprise how much of a punch this ride still packs. It's smooth and pretty intense with some of those G's, the first drop sort of comes out of nowhere as you turn into it, and the zero-G roll and the corkscrews are some other highlights. My wife loved it as well, her smile couldn't lie and the fact she started asking random people how they liked it afterwards is always a good sign. How can anyone hate Batman? 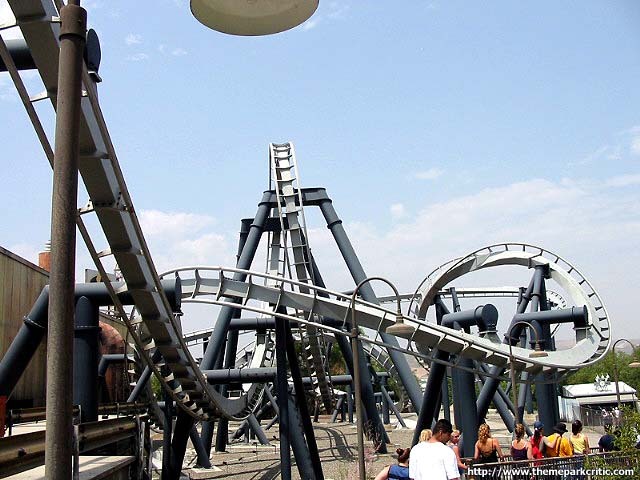 Its got some of the most intense Gs out there during the ride, a variety of inversions, and dare I say it, decent theming! The entire ride is glass-smooth and intense at the same time. This ride is alright but its a gimmick. it is not good enough to be called a great coaster but it is moderately good. 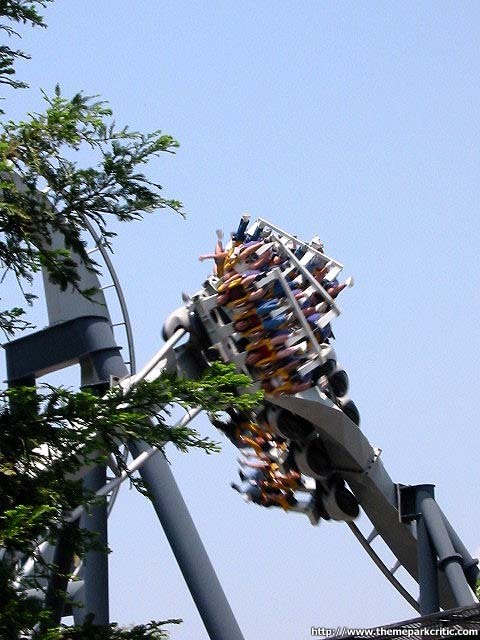 If you want a really good invert go ride Montu or Alpehgheist. the layout may be compact yet thrilling but for an extreme park like Magic Mountain, I was expecting more. Clone. I had my blackberry in by pocket so that made the ride more exciting.LAYOUT:After the lift is a 180 degree left hand drop into a vertical loop. After that is a zero-g roll. All I can remember is a verical loop and two corkscrews after that. I dont know how, but this was my first Batman clone. After riding it, I now understand why it has been made over and over. Its straight up a great ride. The theming for the cue at MM was great and really helped pass the time. It is really strange coming around the corner to see such a dark loading area. I thought the loading dock at DD was dark, but this was crazy. The big Batman emblem looming over everything and the batsuit on the other end was cool too. The lift hill is short and it is pure action from there. The 3 inversion start moves so quickly there is no time to catch your breathe. All elements are packed one right after another and they are all exciting. They were only running one train when I was there, so it was slow, but well worth the wait. What a ride. 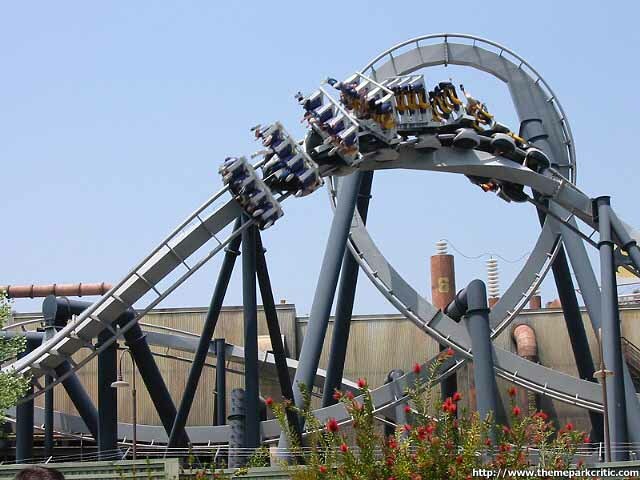 No offense to theose who disagree but i thought silver bullet was better due to the cobra roll and higher drop. But this ride was my first suspended ride and it was a ride i wouldnt forget. This ride is actually number 6 on my all rides top 10 list. 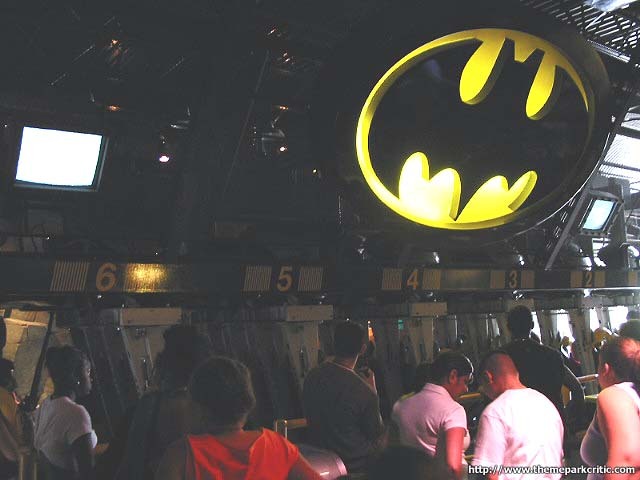 The only one of the Batman the Ride type that Ive been on, and didnt like was SFStL. SFOG, SFMM, and SFGAm are all awesome. SFStL goes the opposite way which apparently matters. I do wish this one was running two trains along with having music inside the Batcave. Its a techno music frenzy, and I guess they dont want to destroy it with other non-techo Batman music. The colors are cool, and the queue is still messed up (Yeah, to theming. They took SFGAm theming mostly away considering the junk and graffati along with changing the color to yellow.). The ride is just like the other GREAT ones. 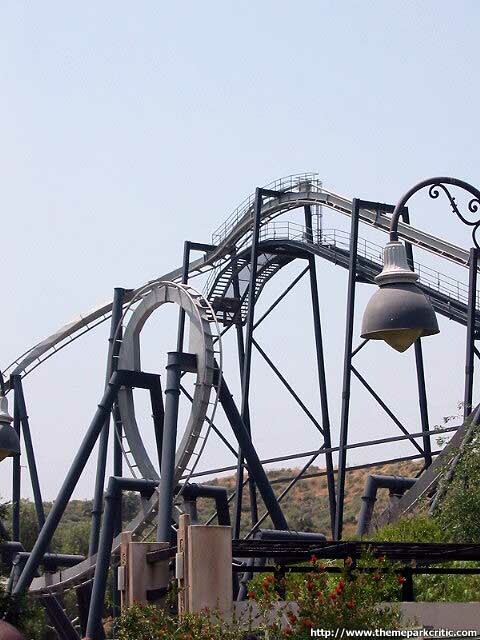 This is not the best ride at Magic Mountain, or even in my Top 10, but it being just an awesome ride anyways, plus the fact that there is no way I am going to SFMM without going on this ride geives it a good rating. It just has to be ridden every time. The only annoying part is that when it gets cool in Southern California, this ride WILL freeze your face.